This acorn-fed Ibérico loin is a piece of classic Ibérico prepared using traditional recipes handed down from the ancestors of Don Augustín's current generation of talented craftspeople. To make it, pork loin is marinated with highest-quality natural ingredients drawn from the finest Spain has to offer: salt, pepper and spices are all carefully selected to ensure that this product comes out just as it should. 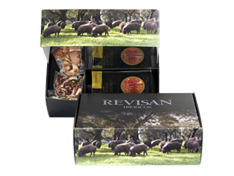 The production of these loins is limited, and only the finest Ibérico pigs are chosen. Format : This loin will reach you vacuum-packed for freshness and protected by red mesh wrapping. Storage : Store this Ibérico loin in a cool, dry place. Consumption : You should consume this loin within a year of purchase to enjoy it at its best.